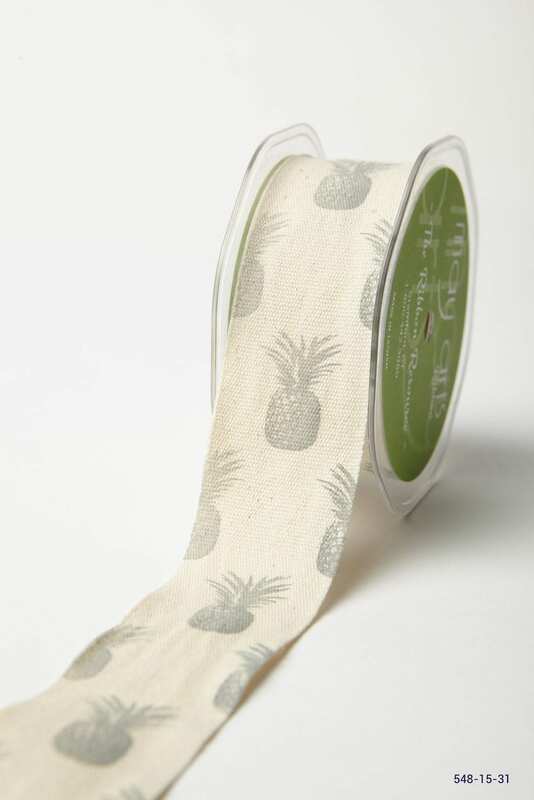 May Arts fun pineapple print on cotton ribbon comes 10 yards to a roll. The 1.5″ wide ribbon is guaranteed to be a hit for summer! The Calypso fashion trend is punctuated by bold and bright colors of the Caribbean. Look for new interpretations of flowers and island flair. Pineapples in particular are everywhere; from clothing to home decor! Once just a symbol of hospitality, now pineapples symbolize quirky fun or southern sophistication. Cotton fabric is great for laying and draping nicely, as well as creating a thicker bow with minimum effort. The printed pattern is single-sided. This ribbon would pair nicely with any grosgrain, sheer or natural jute/burlap.